In our piece on WordPress Hosting and Backup I mentioned that while we don’t generally recommend do-it-our-way hosting solutions, there are a few WordPress websites that thrive using simple themes with little-to-no customization. And as they run in WordPress Managed Hosting environments like the one available free at wordpress.com, they’re all but maintenance free. One such site is WordPress School with Lorelle VanFossen. Ms. VanFossen talks mostly about WordPress trends, and counts among her fans Matt Mullenweg, the guy who runs WordPress. 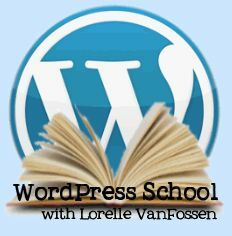 WordPress School with Lorelle VanFossen is in the 70,000 or so most popular web sites in the world. Lorelle VanFossen also is a non-fan of The WordPress Helpers; during our little tête-à-tête with the WordPress developers who hang out on Twitter, Lorelle decided to block us. Pity; I’m about to pay her a compliment she may never see. correction, January 17 2015: Lorelle VanFossen contacted me to state that my understanding on the blocking issue was incorrect; Lorelle, you have my apologies, and a retraction on this point. A few days ago, Lorelle VanFossen published this piece. WordPress Publishing Checklist is a really solid explanation of what goes into writing a WordPress post the right way, painstakingly laid out as a roadmap you can follow. Lorelle includes two downloadable versions of the article, as well. 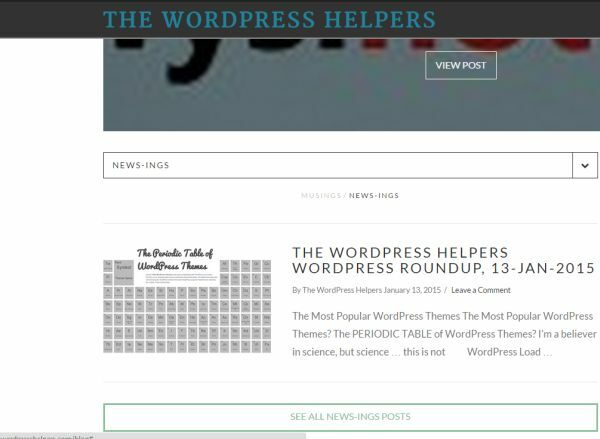 Lorelle VanFossen’s WordPress Publishing Checklist happens also to be a great example of why we’ve started The WordPress Helpers. How Hard is Writing a WordPress Post? Like so many things in the WordPress world, “hard” isn’t really the issue. The problem VanFossen illustrates in her WordPress Publishing Checklist is that as blogging/on-line self-publishing has evolved and matured, doing it right has become a seriously involved process—and while doing it wrong may be better than not doing it at all, merely writing a WordPress post without addressing the ancillary stuff that makes the world see it is a sure path to it being read by a much smaller audience that you’d probably like. Lorelle splits writing a WordPress Post into 18 steps, with several dozen sub points. Add a New Post or Page. Check. Add The Title. Well, sure. And Lorelle’s point about what happens if you skip this and forget is well taken. It also assumes you’ve set up WordPress’ ‘permalinks” to your liking, which is fair; if you haven’t done that you aren’t at the point where you should be writing posts, anyway. Write The Article. OK, that can go here, and Lorelle’s advice about switching back and forth between the visual, not-quite-WYSIWYG editor and the text editor is sound, if incomplete. However, while “write the post” can be #3, we believe it should come after a few of the steps that Lorelle buries at positions 11, 12, and 13 … along with a number of other issues that aren’t addressed at all. Add Links. This is a matter of writing style. Is it better to write your entire post and then go back and add links, or should you be adding links as you write? Of far greater concern is Lorelle’s advice that it’s illegal to use the “open link in new tab” option. I don’t know what Lorelle’s legal qualifications are, but so far as we can tell this isn’t illegal so much as “sometimes considered to be something other than best practice”. THAT SAID: in the United States there is a legal requirement that if you link to something you’re paid to link to, you must disclose that information. Note, by the way, that if you click that link you will in fact “open a new tab”. More on that, and the “incomplete” parts, later. Add Lists: Again, a matter of style as to whether these should be happening as you write your post, or afterward. In the publishing world “after” is correct, mostly because someone other than the article author does all of this. But if it’s you writing, editing, and augmenting the piece, taking care of these elements as you write may well make more sense. Add Video: Uh-oh. These are complicated. 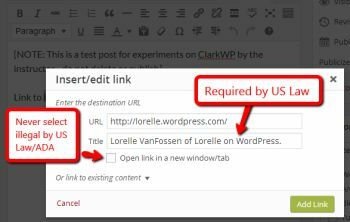 Aside from the questionable legal stuff recurring here, Lorelle does an admirable job of walking through the many options involved in adding media when writing a WordPress post. But with that said, we have issues with WordPress’ Media Library that we believe render its use a last resort. We could write an entire post—or several—on that topic, and will. For the moment suffice it to say that we prefer and recommend inserting images directly via URL whenever possible. Featured Image: Among other things, we believe that you’ll do a better job putting your posts together by specifying—subject to change—the way the gears that control your users’ and search engines’ experience work when reading your post before you start writing. You know what the subject is, so these three should BE step 3; it gives you a chance to craft your writing to focus on those goals as you do the writing. Set Publish Options: Right on, Lorelle. But the save/preview stuff … especially the save part … needs to happen throughout your post creation process. Yes, WordPress auto-saves your work as you go, but anytime you’ve completed constructing anything during the process of writing a WordPress post, please make sure to save immediately. Losing work stinks. Last Check Then Publish: All great advice. All of it. Lorelle’s skills as an editor really show up here. We especially like 17.1 (avoid restyling content and let your theme do its job whenever possible) and 17.7 (not only are pronouns dull, they’re useless for Search Engine Optimization purposes). There’s a lot of content out on the Intertubes. Getting noticed becomes harder every day, meaning the return on your investment in time spent writing is harder to recoup. But create content you must, or you’ll disappear. And you need to optimize that content both for the people who come across it and for Search Engines. There are lots of ways to do this, but if you aren’t including a few tools in your arsenal and using them religiously, you’re going to have a long, hard slog getting noticed. That’s the biggest reason we believe you should be doing the tweaking of your articles not only after you write them, but before and during, as well. Lorelle VanFossen’s WordPress School has a huge audience; for Lorelle, writing a WordPress post can follow exactly the road-map she shared. Finally, back to the issue about whether it’s OK to make links open in new tabs or windows: assuming it isn’t actually “illegal”, the question of best practices is what matters here. And we’ve heard people suggest that “user experience”—specifically that you’re creating an encumbrance for your users by leaving tab “A” open while they read content in tab “B”—is always wrong. We disagree. If your only reason for doing that is to make sure people don’t click away from your site or your page there might be some validity to the idea, but context matters too. Frankly, “losing your way” as a user is just as bad as having tabs or windows left open in a browser. And assuming that a user can, let alone will or wants to need to back track by clicking a button is just as big a faux pas—we say often a bigger one—than opening a new tab. For you, the rules are likely different than they are for Lorelle VanFossen. We’ll talk plenty about tools going forward; we’ll even share the tools we use here with you. For now, a tip of the virtual hat to both Lorelle and her WordPress School for being a great resource. And one to you for hanging in there! Writing a WordPress Post is Easy! Or is it? Writing a WordPress Post is easy, right? Trick question; nothing about using WordPress or writing a WordPress post is difficult; but then there's doing it right.